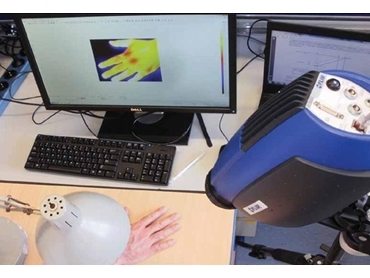 A new research study funded by the Dutch Technology Foundation STW has set a new standard for medical thermography by employing thermal imaging technology to detect neuropathic phenomenon. To stimulate the development of new ways of employing thermal imaging cameras for medical purposes, FLIR Systems has donated a high quality cooled FLIR SC5000 Series thermal imaging camera and dedicated its experienced personnel to this research project. Dr Ir. Sjoerd Niehof, thermography expert at the Anaesthesiology Department of the Erasmus University Medical Center explains that the current method used to detect small nerve fibre dysfunction is skin biopsy but it has serious limitations. Being an invasive method, skin biopsy involves locally sedating the patient and removing a skin sample. In addition to being relatively slow, this method only reveals information about a small area of skin. Thermal imaging on the other hand, can be used to identify small nerve dysfunction in larger areas quickly and in a non-invasive manner, speeding up assessment, and saving time and money, while causing minimal stress on the patient. The research study is based on the theory of blood flow regulation, specifically changes in blood flow. The body has a thermoregulatory control system that responds to thermal stimuli by increasing or decreasing local blood flow, which can be detected using thermal imaging technology. The experimental setup employs an infrared lamp to deliver the thermal stimulus. The hypothesis is based on how the body responds to thermal stimuli, indicating the function and integrity of small nerve fibres. For instance, during small nerve fibre dysfunction or any other illness, the reaction of the body’s control mechanism is likely to be altered. Developing the setup required extensive know-how of the physics and technical details involved, therefore the BioMechanical Engineering Department of the Technical University of Delft, the Netherlands, was brought into the research. Noldus Information Technology was also included in the research to help with observational software development and integration. Yusang Wu, international PhD student at the TU Delft, the researcher responsible for the technological part of the setup explains that the entire setup has to optimally assess the function of the skin’s thermoregulatory nerve system at minimal discomfort to the patient. This meant that the research team had to develop the infrared lamp as well as develop and expand methods for noise reduction, patient data base creation, etc. FLIR Systems provided the researchers with a FLIR SC5000 Series thermal imaging camera, which is specifically designed for highly demanding scientific applications. The Indium Antimonide (InSb) focal plane array detector provides thermal images of 640x512 pixels at a sensitivity of below 20 mK (0.02ºC) with the external triggering feature also allowing it to synchronise with fleeting events. According to Wu, the FLIR SC5000 Series thermal imaging camera has been able to deliver really good data while the support received from the FLIR Advanced Thermal Solutions Department enabled the research team to easily incorporate the FLIR SC5000 into their setup. System development was followed by testing on real patients, during the course of which both healthy test subjects and patients with small nerve fibre dysfunction were investigated using the newly developed test method and the results compared with conventional skin biopsy. The research project hopes to deliver a new method to detect small nerve fibre dysfunction, but Dr Niehof aims to take it forward to develop a system that can be used with other types of illnesses as well, such as burn injuries, Raynaud's disease, vascularisation of skin flaps and skin cancer. Dr Niehof believes that thermal imaging technology has a promising future in medical applications. The use of thermal imaging technology in medicine is currently limited by the lack of standardisation in recording methods and a lack of knowledge regarding the underlying mechanisms that result in the measured temperature differences. The research aims to at least partially fill those gaps, with future research projects helping to further develop thermal imaging technology into an accepted medical technique. FLIR Systems Australia supplies the complete range of FLIR thermal imaging cameras in Australia.